We have our fair share of good bakeries in the Twin Cities. One of them, Patisserie 46, was recently called one of the best patisseries in the world! 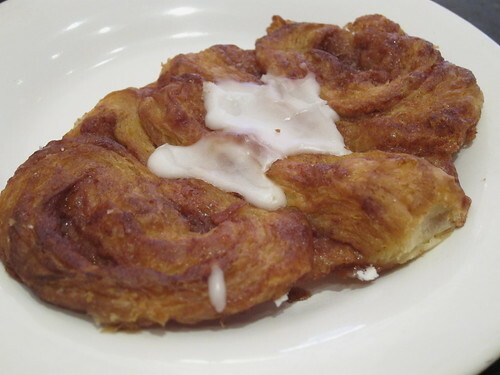 But none of the ones we've tried have the Austrian-style pastries we had gotten just a little addicted to in Denmark. In particular, I find myself craving a kanelsnegle around 4:00 in the afternoon. So, it was time to make my own. 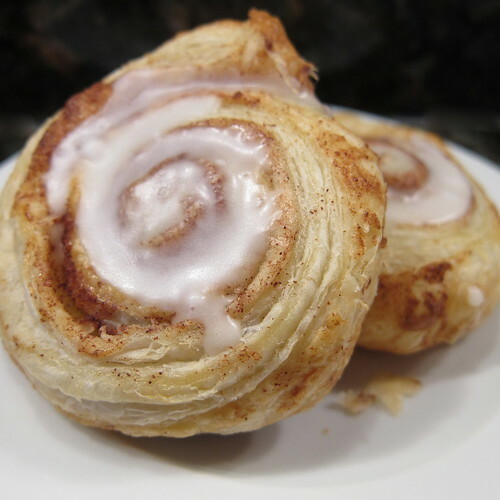 Kanelsnegle is a cinnamon roll, but unlike the bready rolls we tend to see here in the states, these are flaky, like a danish. Now, I could make my own butter laminated bread like I did for the Daring Bakers Danish Braid Challenge, but I wanted something that I could make quickly in the morning for fika in the afternoon. This called for that time saver, frozen puff pastry. 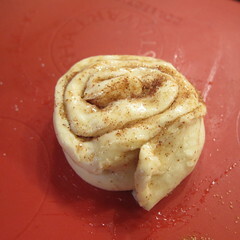 What an easy way to whip up a fresh batch of light, flaky cinnamon rolls. Are they exactly like what we got in Copenhagen? No, of course not, but they were close enough to satisfy. Plus, since they were much smaller, they don't feel like such a huge indulgence. Whisk the egg together with about 1 tablespoon of water. 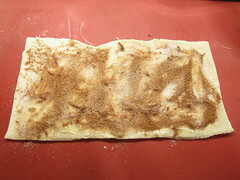 Roll the pastry up with the unbuttered side being last. 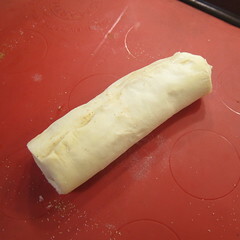 Put a little of the egg and water mixture on that unbuttered end to seal the roll. Slice the roll into 1/2 - 3/4 inch discs. Place flat side down on the baking sheet. I pressed them down slightly. Brush with the egg and water mixture. Bake for 15 minutes or until risen and brown. Move to a rack to cool. Make a glaze by stirring a little milk into some powdered sugar. Just a couple tablespoons of sugar should be enough. You want a thick glaze and will need much less milk than you think. Start with 1/4 teaspoon and add more as needed. Spoon the glaze on top of the cooled rolls and let harden. I think these rolls are best served at room temperature. Just the sort of sweet treat I love! Never thought you could make these so easily! Thanks for the recipe and all the wonderful posts about Copenhagen (so jealous!)! We certainly haven't been everywhere known for good pastries, but I do have to say that the varieties we've had in Austria have been our favorite. This sounds so good right now. It's warm pastry and a cup of coffee kind of weather! These look delicious. I might have to try them for Thanksgiving morning. Thanks so much!